Step 1 Toast the farro in a dry medium saucepan over medium heat until it smells nutty and turns golden, about 5 minutes. Add the water and bring to a simmer. Season with one-half teaspoon salt and cook until the farro is tender, about 45 minutes. Drain (there will probably still be some liquid left), rinse in cold running water and gently pat dry in a kitchen towel. Step 3Whisk together olive oil and lemon juice and stir it into the farro mixture. Step 4Using a mandoline, shave the artichoke hearts as thin as possible, one-eighth inch is adequate, one-sixteenth is better. Add this to the farro mixture along with most of the parsley leaves, and fold together. Step 5Divide the mixture evenly among the serving plates or arrange on a platter. Use a vegetable peeler to shave over thin strips of Parmigiano-Reggiano (you'll need about 1 ounce), and scatter remaining parsley leaves over the top. In Recipes-list.com we have selected the most viewed recipes from category - Quick and easy Salads Vegetarian . Enjoy the best recipes specially selected for you! 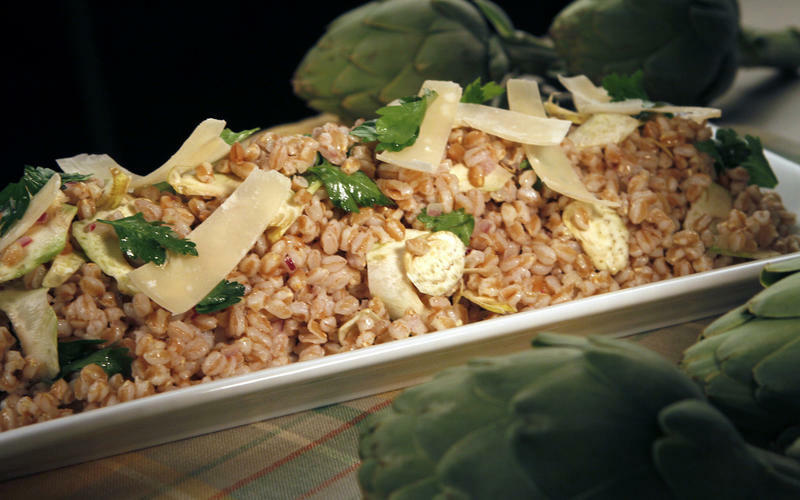 Artichoke and farro salad is the right choice that will satisfy all your claims.